New Delhi: The government is considering to give relief to central government employees amid cash crunch, which refusing to ease on even after six weeks of the demonetisation announcement, official sources today said. “We can expect the higher allowances without arrears under 7th pay commission recommendations in the coming days as the PMO thinks payment of the higher allowances with salaries on salary day cannot be “chaotic”, a close aide of the Finance Minister told The Sen Times. “The PMO might ask the Finance Ministry to ready the higher allowances proposal without arrears before the budget. The Finance Minister Arun Jaitley can also take some time to formalise this announcement. The issue of arrears of higher allowances may not be reconsidered”, he said. Another official said the government is considering to make only allowances hike for its employees. “The financial advisors of the government believe it could be tough to give arrears of the higher allowances as millions will queue outside the money dispensers to get higher allowances as the cash crunch may be normalised in three to four months.”, the official revealed. In the current financial year, the government has given higher basic pay with arrears, effective from January 1, 2016 to its employees on the recommendations of the 7th pay commission but the hike in allowances other than dearness allowance referred to the ‘Committee on Allowances’ headed by the Finance Secretary Ashok Lavasa for examination as the pay commission had recommended of abolishing 51 allowances and subsuming 37 others out of 196 allowances. 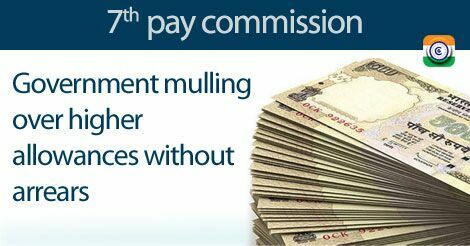 Existing allowances are now paid to the central government employees according to the 6th Pay Commission recommendations until issuing of higher allowances notification. But the government gave extension to the committee up to February 22, 2017 to take cash crunch turn for better. “The government would comply with the cash crunch to give higher allowances without arrears. The government wishes to give the higher allowances with arrears from August to its employees”, said the sources. “The committee on allowances proposed higher allowances from August 2016 but the central government employees unions demanded for implementation of the allowances with retrospective effect from January 2016,” the sources also said.